Equipped with strong Snapdragon 845 octa-core processor, and a combination of latest Android Pie OS(Based on Android 9.0) and large up to 8GB of RAM 256 GB of storage, the phone raises the using experience to a whole new level. Unlock your OnePlus 6T with the fastest hidden in-display fingerprint sensor on any smartphone for a seamless and intuitive unlock experience. Professional cameras equipped on the OnePlus 6T has many functions, scene recognition Nightscape, Studio lighting, etc. It is designed for taking clearer and more detailed photos with Multi-frame Processing. 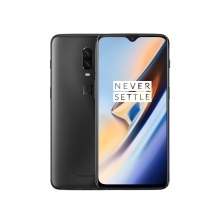 The OnePlus 6T has a non-removable 3700mAh battery with Fast Charging (5V 4A), working with high processor, to deliver a long-lasting performance. Storage: 6GB RAM+128GB ROM, 8GB RAM+128GB ROM, 8GB RAM+256GB ROM optional storage offers you sweeter operation experience. Attention: For Muti-Language supported, we will install Global band for you. NOTE: The actual available internal phone storage may differ depending on the software configuration of your phone.Storage can be checked in our antutu photos and it&apos;s less than specification data. We can&apos;t accept dispute for ROM / RAM data difference.